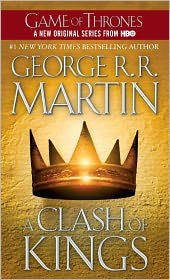 Book two in the popular series A Song of Ice and Fire, by George R.R. Martin brings even more action, battle, and underhanded behind-closed-door dealings on the fight to win the Iron Throne. With a self-proclaimed king in almost every realm of the Seven Kingdoms, it is a calculated fight both on and off the field to oust Joffrey and the Lannister family. This clash of kings introduces new characters, and is another skillful creation of the Houses Stark, Lannister, Barratheon, and Targaryen. There is even a bit more of the fantasy element in this book than in the first, which I thoroughly enjoyed. In George R.R. Martin style, each chapter alternates from nine characters, and I can assure you, it is engaging and never confusing. Each voice is so distinct that I could easily tell who was who as I read each chapter without needing to see their name at the start of their sections. From annoying Theon to my favorites Tyrion and Arya, I couldn't put the book down. Which is why it's hard for me to write that while I still loved the story and the characters, and every ending of a chapter made me manically push forward to read what happened next, this installment didn't resonate as much with me as the first, A Game of Thrones. I normally love battle scenes, for example, but my mind drifted just a bit in those. Maybe it was because it felt a bit more detailed to the point of excess at times? I also didn't care as much for the Targaryen house as I did in the first one, and surprisingly, I also was a little tired of Catelyn as well. It's probably a bit unfair for me to feel that way because A Game of Thrones was so extremely unique and powerful that I would imagine it would be hard for book two to follow it up with the same energy. Suffice it to say, though, that this book served its purpose to set up book three, A Storm of Swords, so I eagerly downloaded it onto my iPad late last night. Looks like I'll be spending even more time with Arya, Jon Snow, and others over the Thanksgiving holiday this week! There are, though, so many new events, characters, and moments, that I cannot wait to see it all played out on the HBO series next April!! Great review! I am actually like half way through, and it's blowing my mind. Maybe it's a bit of a sophomore slump. My son loves this series, but I'm pretty sure it's not for me. There were moments when I felt it drag slightly (only very slightly) but Martin keeps everything moving so fast that I didn't really notice it until I finished. That's really my only criticism though. 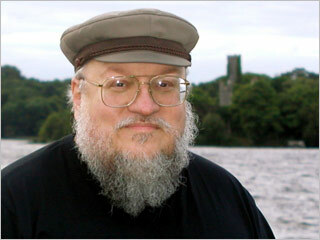 He's an amazing writer of an amazing series. I too didn't love the second as much as the first but it was still a great read. I love the Tyrion chapters. This review (and last night's preview of the 2nd season) reminds me that I have to get reading the 3rd book because it will take me forever! One of the most anticipated series next year! I really like how the way he present the story and his thinking is superb. I am really hoping that I love these books as much as everyone else did, and my husband assures me that I will. If you haven't ever read anything by Guy Gavriel Kay, I would say that after reading these, he is a must read. It's historical fantasy, and he does some amazing things in his books. I would recommend The Lions of Al-Rassan. This was a very thoughtful review today, Natalie. I enjoyed reading it! This is definitely a series I will read. "Clash" is complicated, intense and absolutely epic. It sprawls majestically over a widely varied physical and literary landscape. The politics within the plot, focused on four Kings battling over a land that's used to having only one, are intricate, but not difficult to follow. Martin's writing is clear, his dialogue is smooth and the interplay between characters is enjoyable and completely in sync with the overall tone and 'place' of the story. The book is very serious and heavy - at about 1,000 pages, the book is actually heavy, but I love the weightiness, with corresponding depth, of the story. Ceska - You are absolutely right, it is quite the majestic book! And I also agree his writing is clear and understandable; for me, while it didn't rank up there after reading A Game of Thrones, it is still a phenomenal creation and fits perfectly in the installments. I love George R.R. Martin's stories and writing, so I'm about to start book 3!